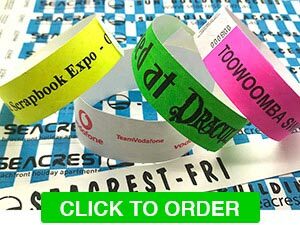 Tyvek wristbands made from Du Pont Tyvek, they are the best value option wristband for single day usage. Available in bright colours, the plain Tyvek wristbands are easily identifiable, non-transferable, waterproof and non-stretch, priced from 5 cents. Custom printed Tyvek wristbands offer more security than plain Tyvek wristbands, as they include your custom design, whilst still being very economically priced. Printing with your logo and text in black and priced from 7 cents each. 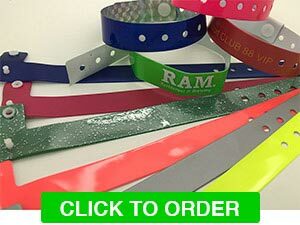 Our PVC plastic wristbands are custom printed with your design, they are perfect for high security events. These wristbands can be used for multi-day events, as they are comfortable, waterproof and durable. Priced from 27 cents each. 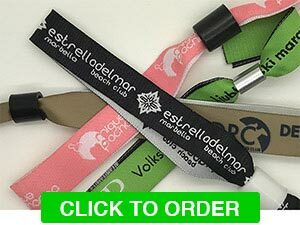 Custom fabric wristbands are the perfect choice for multi-day festivals or upmarket events. We offer them in either woven or full colour sublimated styles with one-way security locking collar. Still economically price from 36 cents each. Printed Silicone wristbands are a great for events, product launches and awareness campaigns. These wristbands are highly visible, comfortable to wear, available in any band colour and print colour. Each wristband with custom design, priced from 40 cents each. Debossed Silicone wristbands are extremely durable. These are perfect for charity and fundraising events. Your design is debossed into each wristband to give subtle, yet distinctive look, while being economically priced from 40 cents each. Infilled Silicone wristbands combine the visibility of printed wristbands with the durability of debossed wristbands. Featuring your design embossed then colour filled. This gives a stunning appearance and yet still competitively priced from 50 cents each. 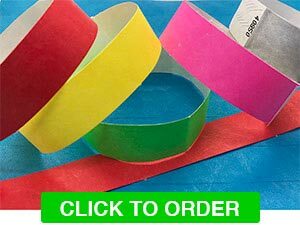 Click here to view our extensive range of tyvek, fabric and silicone wristbands in one place. Pricing from as low as 5 cents each. Remember, if you can't see the style of wristband you are looking for, please email us, as we more than likely have it. Wristband Shop, by Powerful Brands, is owned and operated on the Gold Coast in Queensland, Australia. In stock products are shipped within 24-48 hours of payment. Free regular shipping, by Australia Post, on all orders Australia wide. 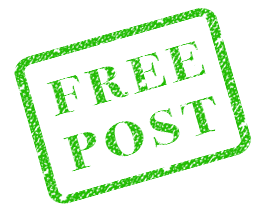 Upgrade to Express Post for only $10 and have your order delivered to most metropolitan areas one business day. We guarantee to beat any Australian competitor by 10% on the exact same product. Simply forward a copy of the quote and we will beat it by 10%. We offer free regular shipping, by Australia Post, on all orders Australia wide. Perth, Sydney) within one business day from the Gold Coast, Queensland. All prices are inclusive of GST. For custom printed products the prices also include artwork setup costs.